On a cold, bleak, frigid January night in New York City, history was made! With former Knick greats such as Allan Houston, Patrick Ewing, and Larry Johnson gracing the refurbished Mecca known as Madison Square Garden, Carmelo Anthony put on a shooting clinic that will forever be considered ‘one for the ages’! But it wasn’t only Melo’s unbelievable performance that impressed, it was the way it became contagious for a team that was having a horrid year through the first half of the season and had just finished losing their third home game in a row to the team with the 3rd worst record in the NBA, the 76ers. “I’m tired of losing”, is what the now seven time All-Star said at halftime. Carmelo didn’t have one assist in this historic game, at least not statistically, but emotionally he single-handedly lifted the spirits (and the game) of the other Knick players to a level not seen all that often this season. The crowd was the most electric that the Garden had witnessed in quite some time as Melo set an all-time record for most points in a game by a Knick, and the most at the current Madison Square Garden. It was also the most points (125) scored by the Knicks this season. It was the kind of night that made all the Knick fans, the players and even the media, cease all conversations regarding the fate of coach Mike Woodson, the bickering and complaining during post-game interviews by Tyson Chandler, and even the idiotic antics of J.R. Smith not so long ago and instead was replaced with cheering, standing ovations, and chanting of “Meh-low”, Meh-low”, “Meh-low” with a couple of “MVP! MVP! MVP’s! thrown in just for good measure. It was sheer joy (and madness) watching someone who was so much in a zone as Melo was tonight. You just didn’t want it to end. The one thing you DID want to see was Carmelo breaking the record even though by the fourth quarter he clearly was winded and was traversing the floor of the Garden with rubbery legs. It brought back some memories of that night some five years ago when Kobe Bryant put on a similar performance setting, which was then, the all-time Garden record for points scored at 61. And there was another game way back on Christmas Day in 1984 when Bernard King set the Knick record at 60 (in a losing effort 120-114 to the then N.J. Nets)) which stood until tonight, almost thirty years later. What is left to be determined however, is the impact that this herculean display by Melo will have going forward for a team fighting to stay alive in the playoff hunt. It doesn’t matter that as currently comprised, this team will not advance very far in the post-season should they get there, because in sports stranger things have happened. 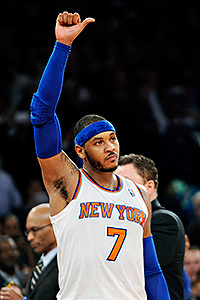 Still, until and unless Melo gets some help, it will be more of the same for some time to come.. The Furnace scored some tickets to see the Knicks take on the Celtics, a heated rivalry to be sure, and was fortunate enough to witness not only a Knicks win on Saturday, but a Garden revival- full of the ‘Pomp and Cirumstance’ that has helped to make Madison Square Garden “The World’s Most Famous Arena.” It brought back many memories of when the Garden was the hottest ticket in New York! Stephen A. Smith, broadcasting for ESPN just prior to the game at Knicks legend Walt Frazier’s restaurant, Clyde’s Wine & Dine, was heard urging Knick fans to be at the game early, before the intros, and to show the team that the time is NOW! He begged his listeners not to be like the fans in South Beach who traditionally don’t show up for a Heat game until a half hour after it’s started. By game time Saturday, about a third of the seats were still empty but shortly thereafter, the sellout crowd of 19,763 was there in full force and all in attendance, save for a small smattering of Celtic diehard fans, were urging their team to “Play for Now!” The Knicks ‘theme’ for the 2012-2013 season. To say that the Garden was rockin’ would be an understatement. 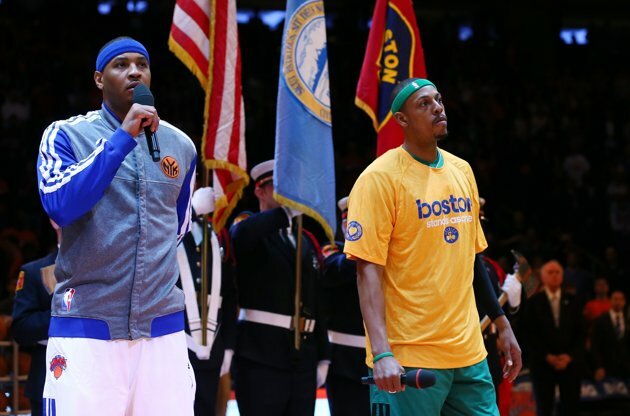 It helped re-defined the words “Playoff atmosphere.” However, there was the awkward moment before the game began when Carmelo Anthony and Paul Pierce were introduced before they made a couple of short comments on the Boston tragedy. They came out from opposite sides of the court and never looked at each other nor shook hands. During the game the fans outdid themselves with chants and expletives. They roared when John McEnroe was given a screen shot. 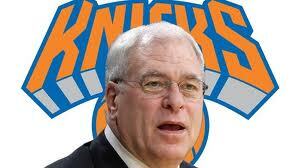 Same for newly Hall of Fame inductee Bernard King, and likewise Larry “Mr. 4-point play” Johnson. However the loudest ‘boos’ of the evening came when a shot of Jets QB Mark Sanchez sitting court side appeared on the live big board screen. It was so loud that all Sanchez could do was put on an embarrassing half-smile. And then there were the throngs of fans who were totally disenchanted with many of the refs calls & miscalls which prompted a hearty rendition of “These refs $#@&!” “These refs &%$@!” These refs @#$&!” It must have worked because in the fourth quarter there were hardly any calls made to speak of on either side. 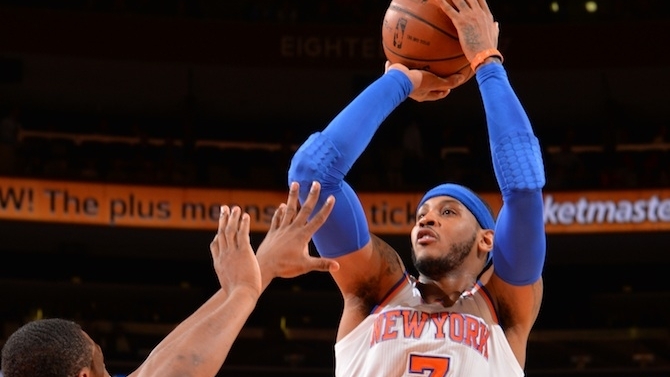 Then came something New York Knicks fans haven’t seen in quite some time. As soon as the game ended, the Garden floor began filling with players, photographers and fans swelling in droves from all angles as if it were a game seven victory in the NBA Finals. It was a welcome sight for the much beleaguered team that hasn’t had much to cheer about in many post-seasons over the past decade. 1. Raymond Felton missed four lay-ups. If he makes them the Knicks probably win by 15! 2. A rusty Tyson Chandler,playing in just his 4th game in the last 21, could only muster up 5 boards & 0 points in 20 minutes. 3. Iman Shumpert stayed in foul trouble throughout most of the game. 4. A nervous Chris Copeland, playing in his first playoff game, looked tentative shooting 0-3 from the floor with one steal. 5. 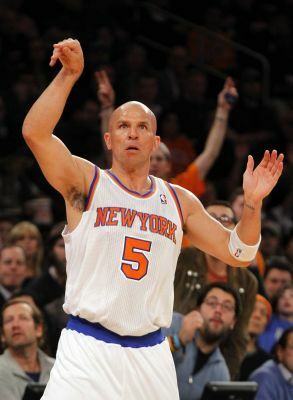 Jason Kidd, the Knicks’ future Hall of Fame point guard, has played more postseason games (147) than any other player in the Eastern Conference. In the whole NBA, only Derek Fisher, Tim Duncan and Tony Parker have seen more postseason action. His playoff smarts during game one helped the Knicks from letting the game get too much out of hand by his contributions which included eight points, five rebounds, three assists, and three steals. 6. Kenyon Martin’s near double-double (10 points -9 rebounds) plus his tenacity & experience, helped the Knicks hold the Celtics to just 25 second half points and only 8 in the final quarter. 7. The last time the Knicks lead in a playoff series was April 29, 2001 vs Toronto with players like Othella Harrington & Felton Spencer on the club. No, Phil Jackson did not return to coach the Knicks nor will he do so anytime soon… He was just one of many who returned Friday night to commemorate the last championship team that the Knicks have had in four decades. What sort of reception would the most successful coach in NBA history receive from the Garden faithful? It was almost a year ago, June 2012, that ex-Knick and 11 time NBA Championship coach Phil Jackson, scoffed at the notion of coaching the Knicks, stating, ” They have a clumsy team!” Personally, I feel that Phil was just saying that out of disappointment for the Knicks for not even offering him the post occupied by Mike D’Antoni before Mike Woodson was named the interim and later the head coach. 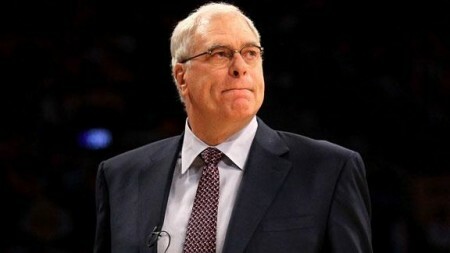 “There’s just too much work that has to be done with that team, they don’t fit together well.” Phil Jackson stating his disinterest in the Knick’s coaching job In June 2012. If you remember, he also told the press that he didn’t want to travel because he wanted to spend as much time as possible on his Montana estate and New York was just too far away for his liking. The press here as well as countless bloggers, chastised the Knicks for not even extending Jackson an invitation to discuss the possibility of taking over the head coaching job. 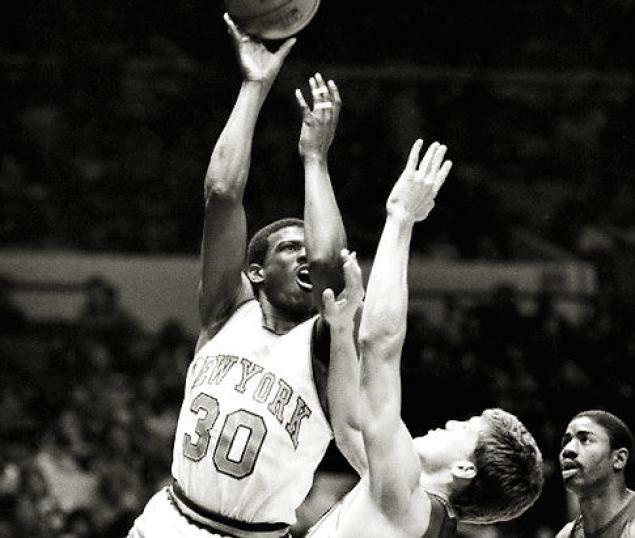 Knick fans, after all of Jackson’s sound bites had filled the newspapers and the internet showcasing his ‘disinterest’ in the vacancy, turned sour on the Hall of Famer, especially once the season began. 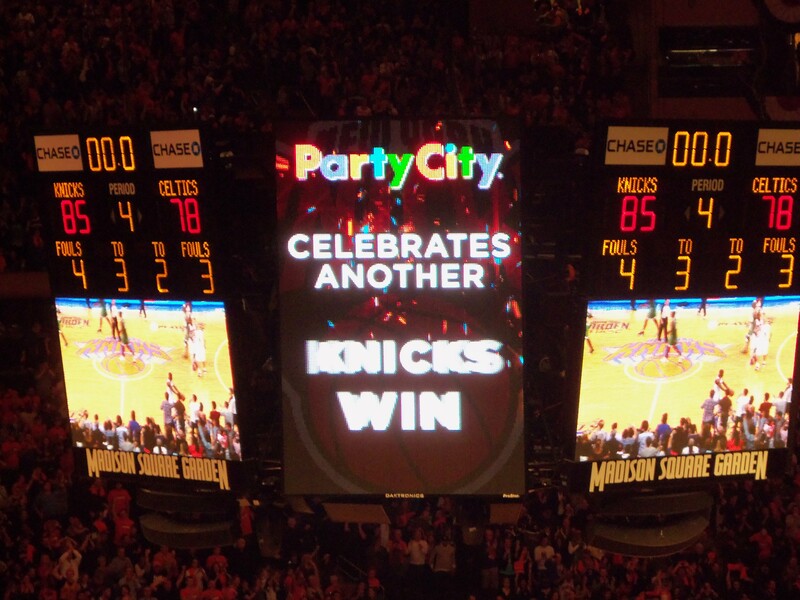 D’Antoni was soon shown the exit sign, and then Linsanity took over New York City and the sportsworld at large. 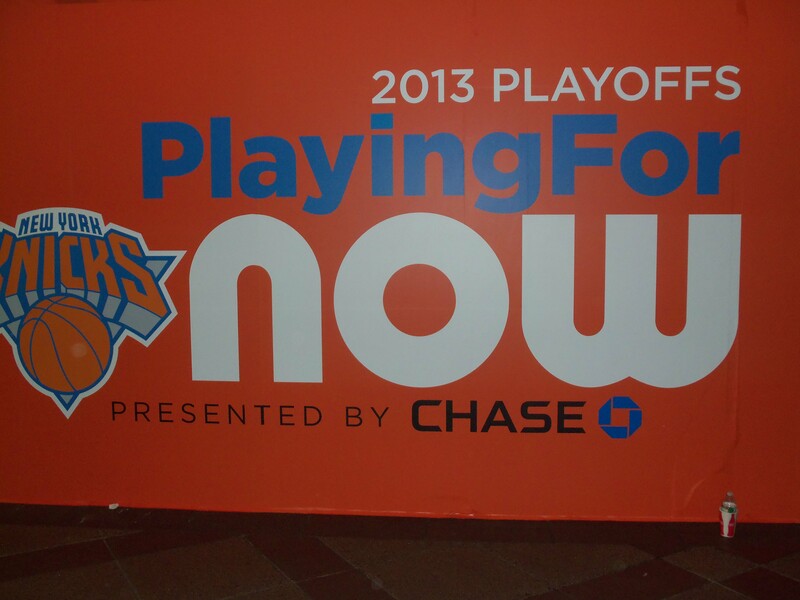 Fast forward to last night’s festivities at Madison Square Garden. Legends night. 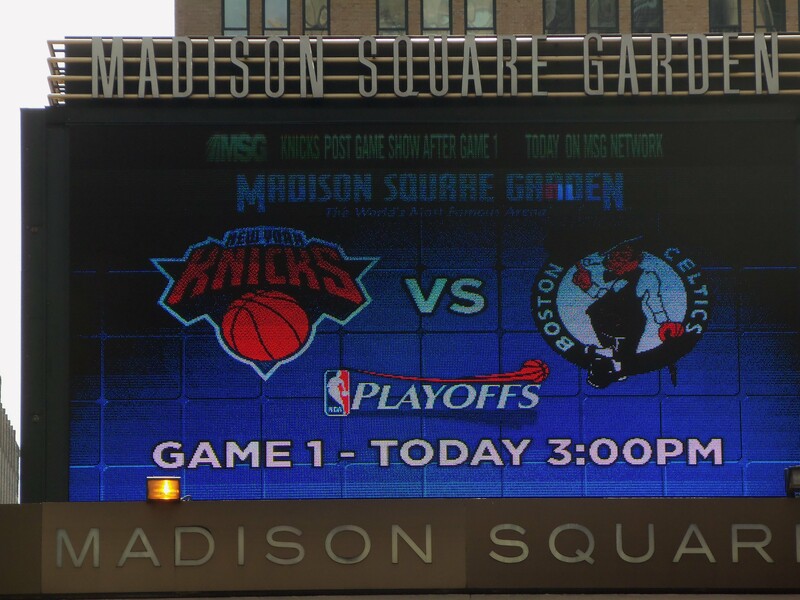 The commemoration of the 1972-1973 NBA Championship; the last one the Knickerbockers would win over the past 40 years. 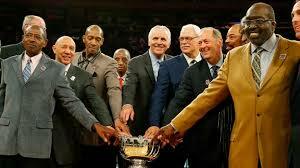 All the players from that legendary team, save for Dave DeBusschere who passed in May of 2003 at the age of 62, were there as speeches and awards filled the World’s Most Famous Arena. The former superstars would be announced to the capacity crowd once halftime was underway and I thought to myself, “I wonder what kind of greeting PhilJackson will receive from the throng of Knick supporters on a night the team would be gunning for its 11th consecutive victory?” If I was a gambling man, I would have said it would have been split right down the middle. But to my surprise, and delight, it was overwhelmingly a pro-Jackson reception! And just then, the analytical part of me couldn’t help but wonder why it was so one sided in Jackson’s favor. 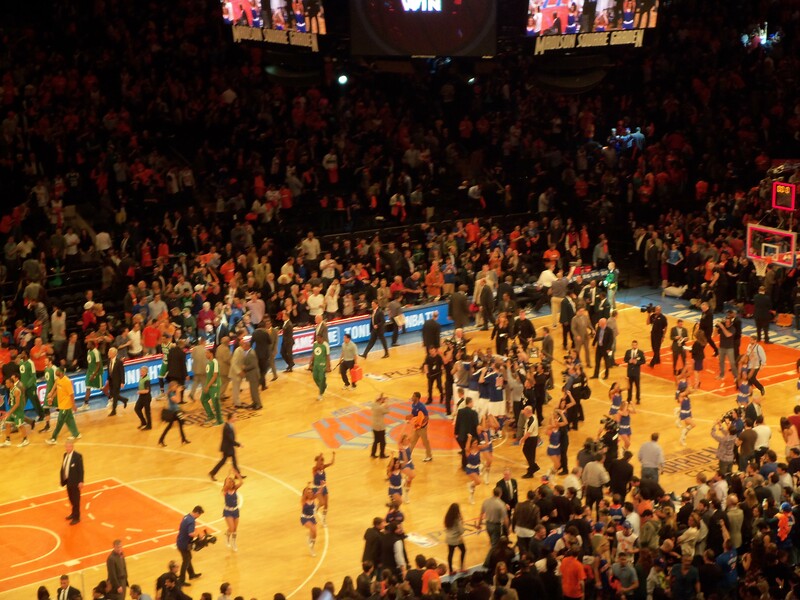 And then it hit me… The Knick fans have been treated to an amazing season to this point. 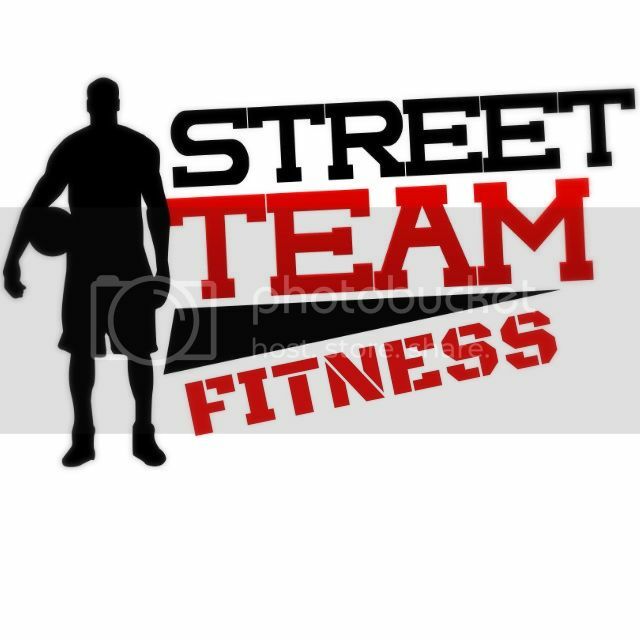 After all, their club had been playing winning ‘team’ basketball for most of the year and in particular the previous 10 games-all wins. The playoff picture looked bright at the prospect of facing the 7th seeded Boston Celtics, and all was going well for the much maligned team. And because of the euphoric state of Knick fans, they were not going to single out anyone from that glorious era and display any negative emotions on a night when the franchise and these stars were being honored. They decided, and quite appropriately, to cut Jackson some slack. On the other hand, had the Knicks been 26-49 instead of 49-26, you can bet that Jackson’s introduction would have been met with a completely different reaction. They would have let their frustrations out on the coach of a Bulls team that used and abused the Knicks back in the day. The coach with Michael Jordan, Scottie Pippen, Horace Grant, Bill Cartwright, B.J. Armstrong & co. who dominated the sport for a good part of the 90’s, culminating with a record-breaking 72 wins in the ’95-’96 season.